the Friday 0.9.x release "mini tradition" continues by the release of the 0.9.7 today. Though the changelog is rather long, the amount of code behind those changes is rather small (they were all simple fixes). If the amount of stress and haste before the release would be a measure of release quality then 0.9.7 should do rather good. We released it before Friday lunch without any last minute hotfixes and without any complications. The pack in the post title refers to the scenario pack. The set of currently 3 "mini campaigns" available for the furnace attendant tier or higher. We finally got around to make it compatible with the 0.9.x release branch. So now there is a scenario pack 0.9.7 available that will work with the 0.9.7 binary version. The changes have been quite significant, because the Tight Spot and Supply Challenge had to be rebalanced to take the oil industry into account. The playtesting of these has been a refreshing experience and definitely a good motivation to think about new challenge missions and content for the scenario pack (we still take it as a work in progress). You can check out the main part of the factory that got me through the new Supply Challenge below. It was built in about 3 hours under constant pressure to provide 6 "hungry chests" in the center with new and new items - that is why it is called the Supply challenge. Recently a lot of old entities have been reskinned or remade. 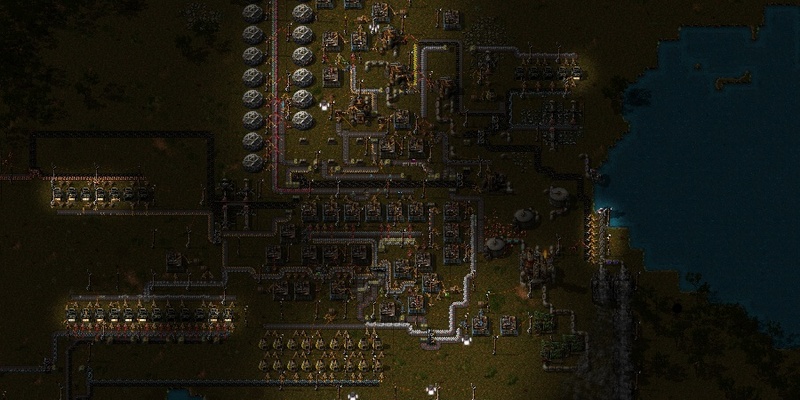 Things like inserters, transport belts or assembling machines are now (0.9.x) consistent with the artistic direction. This is all part of the plan to improve the visuals for our new trailer. It has been taking ages, but we are really getting close now. Albert is now working on doodads and aesthetic tweaks for the trailer map. Actually we just spent like 2 hours discussing some details of the map :) Please bear with us a little longer. In the meantime you can enjoy the "good-old" red cadillac in the old trailer, it is not going to be around for long. If you have something to say, then say it at our forums.